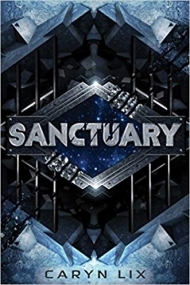 Alien meets Alexandra Bracken’s The Darkest Minds in this thrilling debut novel about prison-guard-in-training, Kenzie, who is taken hostage by the superpowered criminal teens of the Sanctuary space station—only to have to band together with them when the station is attacked by mysterious creatures. Kenzie holds one truth above all: the company is everything. As a citizen of Omnistellar Concepts, the most powerful corporation in the solar system, Kenzie has trained her entire life for one goal: to become an elite guard on Sanctuary, Omnistellar’s space prison for superpowered teens too dangerous for Earth. As a junior guard, she’s excited to prove herself to her company—and that means sacrificing anything that won’t propel her forward. But then a routine drill goes sideways and Kenzie is taken hostage by rioting prisoners. At first, she’s confident her commanding officer—who also happens to be her mother—will stop at nothing to secure her freedom. Yet it soon becomes clear that her mother is more concerned with sticking to Omnistellar protocol than she is with getting Kenzie out safely. As Kenzie forms her own plan to escape, she doesn’t realize there’s a more sinister threat looming, something ancient and evil that has clawed its way into Sanctuary from the vacuum of space. And Kenzie might have to team up with her captors to survive—all while beginning to suspect there’s a darker side to the Omnistellar she knows.